"…it couldn't have gone better." We had an absolutely great time. Except for a couple of days when Kiltie didn’t feel well, it couldn’t have gone better. Wahid was great and was far more than just a driver. He spent all kinds of extra time with us to make sure we had a good experience. He is an extremely good driver and never once took a risk that we felt uncomfortable with. How do those guys maneuver a van through that traffic on those narrow streets beats me. We never so much as saw fender bender although J & S did see a damaged motorcycle driving into Marrakesh. 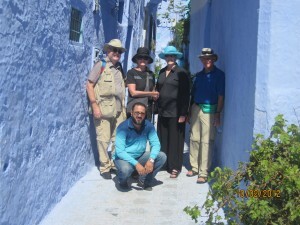 Accommodations were all wonderful, especially Dar Meziana in Chefchaouen. One of Kiltie’s down days was at the Jardins and we were fortunate to be able to stay another day while Jake & Shari went on to Marrakesh. Wahid came back for us the next day. 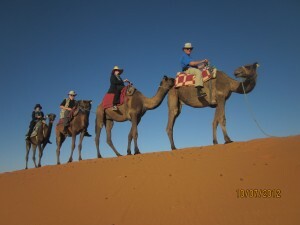 Guides were all good and especially Mohammed Bouziani in Fez and Mohammed in Marrakesh. Mr. Ahmed(sniff-sniff – that was a joke with the young guys working in the Dar as Mr. Ahmed sniffed Moroccish tobacco) in Chefchaouen was also good. Another time we would insist on smaller meal plan and would be more wary of what and how we ordered in restaurants. It took Wahid the whole trip to realize that we only wanted small meals. Ordering “al-a-carte” verses the “menu” was confusing and took us a long time to grasp. Meals in the restaurants that cater to mostly tourists were not a hit with us, especially the one in Marrakesh (very noisy and the belly dancer wasn’t that great) and also one in the New Town of Fes. We much preferred eating with the locals. Many of my best memories were in having communications with the locals or wandering about on my own. 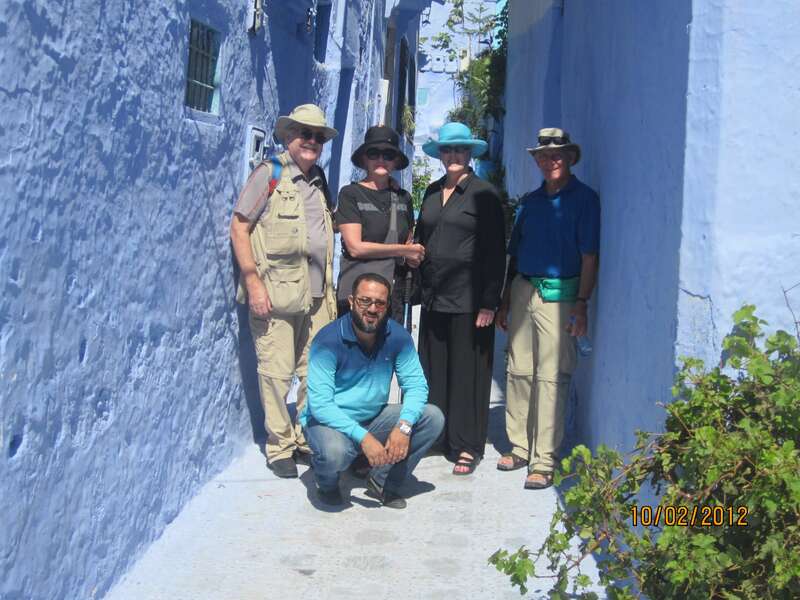 We always felt safe and never did we have concerns either in Morocco or Spain although we did heed advice on traveling in certain areas and/or at certain times. A couple of the days were quite long although we were very thankful to Wahid for taking the time to show us more rather than less. When we bumped into the two 89 year old ladies at Jardins de Skoura, traveling alone with a driver, one with no luggage (lost by Air France), we felt as though we should be able to tackle anything. Your program was more expensive than some others we looked at, but we always felt you were listening to us and trying to fit our requests as best you could and gave us the comfort you really knew what you were doing. Many times during the trip we congratulated ourselves for choosing Morocco Tours/Experience IT! Tours!